Scientists with tweezers picked through the twisted wreckage of a space capsule that crash-landed on Earth, hoping that microscopic clues to the evolution of the solar system weren't completely lost in Utah's salt flats. NASA engineers were stunned Wednesday when neither parachute deployed aboard the Genesis capsule and the craft plummeted to the ground at nearly 200 mph, breaking open like a clamshell and exposing its collection of solar atoms to contamination. "Everyone was thrilled as they saw the pictures of the spacecraft coming back, and it just changed — it was like a 180-degree turnabout as it suddenly crashed on the surface of the Earth," reports CBS News Correspondent Steve Futterman at the Jet Propulsion Laboratory in Pasadena, Calif. "There was just dead silence here." The atoms were embedded in fragile glass-like wafers, reports CBS News Space Consultant Bill Harwood. A mid-air capture had been planned because of concern those capture plates would break or shatter even in a parachute-assisted landing, making data analysis extremely difficult. "There was a big pit in my stomach," said physicist Roger Wiens of Los Alamos National Laboratory. "This just wasn't supposed to happen. We're going to have a lot of work picking up the pieces." The capsule held billions of charged atoms — a total haul no bigger than a few grains of salt — that were harvested from solar wind on five collecting disks during the 884-day, $260-million mission. Roy Haggard, who took part in the initial reconnaissance of the capsule, said the capsule's shell had been breached about three inches and the science canister inside appeared to have a small break. The inner canister was flown to the Army's air field at the proving ground and put in a clean room, a work area in which the air quality, temperature and humidity are highly regulated to prevent contamination. The reconstruction was expected to take several days, and scientists were hopeful they could salvage the embedded atoms among the twisted platters of exotic metals and silicone. "This is something that's not a total disaster," said Carlton Allen, astromaterials curator for the Johnson Space Center in Houston. "We didn't lose all the science in the crash." "We fully expect that we will be able to make good use of those materials and derive some science," said Steve Brody, Genesis program executive at NASA headquarters. NASA planned to appoint a "mishap review board" to determine a cause for the failure. Flight engineers say a set of tiny explosives didn't trigger the capsule's parachutes, although the fact that all explosives failed pointed to another cause. The spacecraft was designed and built by Lockheed Martin Space Systems near Denver. Robert Corwin, an engineer for the company, said a battery that overheated shortly after the 2001 launch could be a culprit. The mishap also raised questions about the durability of another NASA sample-return capsule called Stardust, due to land here in 2006. But that capsule was built to be more rugged and will land on its own with a parachute. Scientists got their first glimpse of the damage when the Genesis capsule was wheeled into a garage bay late Wednesday. The capsule's inner canister was all but unrecognizable, although scientists thought they saw some unbroken parts holding the atoms. The space capsule had been outside the earth's magnetic shield for three years, collecting solar wind particles that could explain how the sun formed an estimated 4.5 billion years ago and what keeps it fueled. The atoms were captured on 5-foot disks, each with hexagons of gold, sapphire, silicone and diamond. Each collector array was assigned to catch various types of solar wind. The five disks were of different thicknesses, which could make it easier for scientists put the pieces back together like a puzzle, Wiens said. 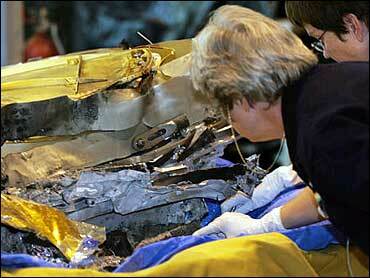 The disks were so tightly packed within the canister that it was hard to tell how badly they were damaged. Hitting the atmosphere at 24,700 mph, the 420-pound sample canister's energy of motion was equivalent to that of a 4.5-million-pound freight train moving at 80 mph. In seconds, most of that energy was converted into heat, subjecting the probe's heat shield to temperatures up to 4,700 degrees and slowing the craft with a braking force of 30 times Earth's gravity. Two minutes after entry began, at an altitude of about 21 miles, the small drogue parachute was to have unfurled to stabilize the craft and four minutes after that, at an altitude of about 22,000 feet, a wing-like parafoil was to deploy, slowing the craft's descent to a gentle 10 to 12 miles per hour. Helicopters flown by Hollywood stunt pilots were supposed to grab Genesis almost a mile above the Utah desert and lower it gently to the ground by snatching its main parachute with a hook. But before the capture team learned of the parachute failure, the speeding capsule had plummeted into the Utah desert. Solar wind is a stream of highly charged particles that are emitted by the sun. The Genesis mission marked the first time NASA has collected any objects from farther than the moon for retrieval to Earth. Why did NASA spend more than $264 million to capture a few wisps of the solar wind? Explains Harwood, it's because those traces are expected to serve as a sort of cosmic Rosetta stone, providing critical insights into the birth and evolution of our solar system.